I am an absolute sucker for the art that can result from heartbreak. I have the utmost respect for people who can turn the depths of despair into a positive, creating something beautiful from one of their lowest points of life. For example, In The Wee Small Hours is my favorite Frank Sinatra album by a wide margin, as he wades through the anguish of his split from Ava Gardner. Consequently, the narrative is dotted with delicious recipes, odd yet surprisingly welcome additions to the novel: three different types of potatoes to get you through depression, or a deep dish peach pie. I’ve tried a number of them, but the Heartburn recipe I turn to most often is Nora Ephron’s basic vinaigrette. It only has three ingredients, and the ratio is so simple it has saved me from searching for any salad dressing recipes by just pulling this vinaigrette formula out again. All you need to remember: 2-2-6. Even Ephron acknowledges the dressing’s greatness in Heartburn: “[I] had gotten to the point where I simply could not make a bad vinaigrette, this was not exactly the stuff of drama. (Even now, I cannot believe Mark would want to risk losing that vinaigrette. You just don’t bump into vinaigrettes that good. )” The recipe also makes the perfect amount for a dinner salad for about four people. I must admit, though, that I often use Ephron’s vinaigrette as a base for more ambitious variants (Find some more ideas for salad dressings here). While Ephron uses red wine vinegar, my preference is with balsamic vinegar—it gives the dressing a sweeter, more rounded presence. (If you do use red wine vinegar, you might consider adding a touch of honey or sugar.) I also like to add some lemon or lime zest (not juice, as it’s already acidic enough), some snipped fresh herbs depending on what I have growing at the time, maybe some garlic. But it’s a surprisingly creamy vinaigrette that stands up on its own; Ephron’s character was absolutely right, that guy was crazy to walk away from someone who can cook like that. Ephron’s ability to create wonder out of heartbreak is a fabulous success story. She wrote her second screenplay (Silkwood was the first) for Heartburn the movie, with Meryl Streep and Jack Nicholson as the stand-ins for Ephron and Bernstein. She successfully remarried to Wiseguy author Nicholas Pileggi, and went on to write movies now as beloved as When Harry Met Sally, adding directing as well to films like Sleepless In Seattle and Julie & Julia (highlighting her cooking knowledge). Her ties to food, apparently, remained strong as well; not that I need another reason to hate Gwyneth Paltrow, but she got to go to some parties I would have killed to be able to attend, as she noted on her Goop website: “Nora Ephron was the best dinner party hostess. Not only was she an unbelievable home cook who put together meals with ease and grace to spare, she was an amazing conversationalist who could really engage the table.” I have no doubt. 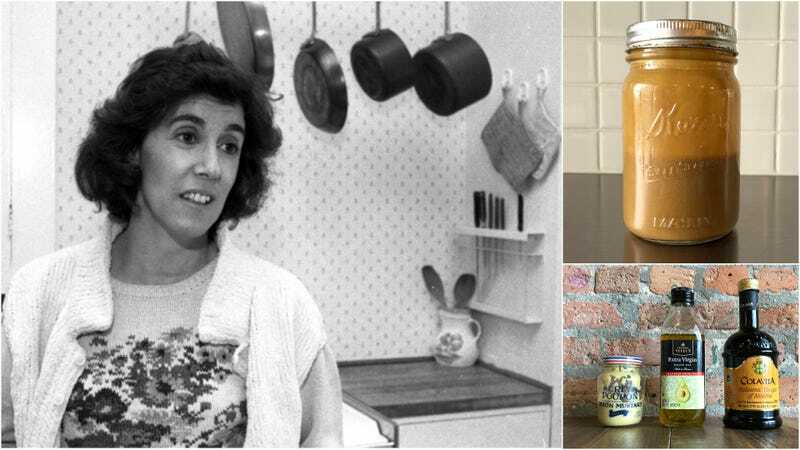 Ephron died in 2012 at the age of 71, leaving us a multitude of classic movies, funny books, excellent recipes, and a valuable lesson about emerging triumphant from heartbreak. Mix the mustard and vinegar together. Then, while whisking continuously, add the oil slowly to the mustard and vinegar mixture. The vinaigrette will become thick and creamy. Add to salad. Store unused dressing in the refrigerator. Just remember: 2-2-6, mustard-vinegar-olive oil. Congratulations: now you’ve got that ratio memorized for life.